You'll get fresh tasting vegetables from this steamer pan! Farberware Classic 3-Quart Stainless Steamer Pot Set is a good looking set of efficient stainless steel cooking pots that will help you achieve healthy eating. Stainless steel material Is durable, dependable, will not rust, and is difficult to scratch. It offers a special beauty to cooking pan products. "Full Cap" base Provides an aluminum core wrapped with a thick layer of stainless steel that offers good heat distribution. Phenolic handles Are oven safe up to 350º F or 180º C.
Lid Fits tightly so that steam becomes self-basting to add flavor to food and prevent it from drying out. Rolled pan rim Is thicker, provides a stronger edge, and makes pouring from the pan much easier with fewer drips. 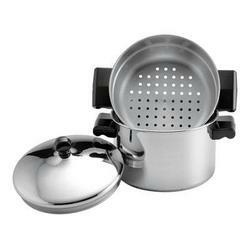 Steamer pan Offers a method of cooking that preserves nutrients in foods.